When a common task is performed so excellently it gains the power to inspire, you call it art -- whether it's tossing a ball sixty feet, six inches in front of thousands of people, or tossing an even bigger ball 62 feet, 10 3/16ths inches in front of dozens of people, some of whom are only there for the cheap beer. 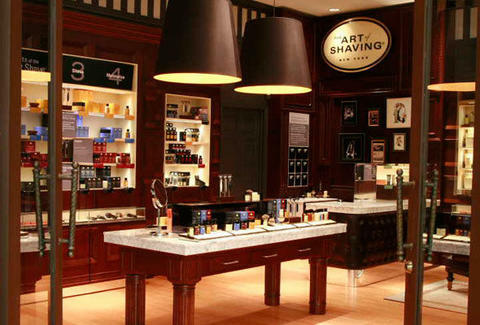 Now bringing inspiration to handsome Chi faces: The Art of Shaving. Hot towel, Pre-Shave Oil massage to protect the skin and soften the beard, warm Shaving Cream application, two shavings (first with the grain, then after re-lathering across the grain), a 2nd hot towel, After Shave Mask to rejuvenate and purify the skin and replenish nutrients lost during the shaving process, After Shave Mask removed with natural sea sponges soaked in lemon essential oil, After-Shave Balm to replenish natural moisture. In other words, they're not screwing around here. Because it's important to teach a man to fish, they're also offering Thrillist readers a complimentary take-home kit: "The 4 Elements of the Perfect Shave", that combines aromatherapy based products with handcrafted shaving accessories. The Kit includes a Pre-Shave Oil, Shaving Cream, After-Shave Balm, and a Pure Badger Shaving Brush. To get yours, just join their mailing list, and they'll send you a coupon redeemable at any The Art of Shaving store -- because the only thing more inspiring than art, is "Free".